Julian Assange’s current living conditions in the Embassy of Ecuador in London are more akin to those of a political dissident in China or Stasi-era Germany — not a journalist claiming political asylum from a country that once promised to protect his right to publish information. I last visited Assange in March, days before the Ecuadorians placed the award-winning journalist in isolation for allegedly violating a draconian ban on all public political comments. That isolation has since been — mostly — lifted, but I felt a sense of trepidation as I approached the embassy last Monday — the Ecuadorians, pressured by the U.S., are widely believed to have grown hostile to Assange, so I didn’t expect a warm welcome. I wasn’t wrong. Things have changed a great deal since I last saw him. The surreal conditions are more invasive than visiting someone in a federal penitentiary — which I’ve done, by the way — where at least you can speak privately, provided you aren’t shouting and causing a scene. In order to visit the publisher last year, I simply organized it with him and his lawyer and went. This time I was required to provide details about my social media, my employer, and my reason for visiting in advance of my arrival and hope to be approved. If I wanted to bring my cell phone, I would have had to provide the brand, model, serial number, IMEI number and telephone number. Providing these details to a foreign nation with extreme surveillance seemed unwise, so I left it behind. The new protocol also states that the embassy will keep a record of all visits made to Assange and the data that they provide. This information will be sent to the Ecuadorian Ministry of Foreign Affairs and other undisclosed agencies. 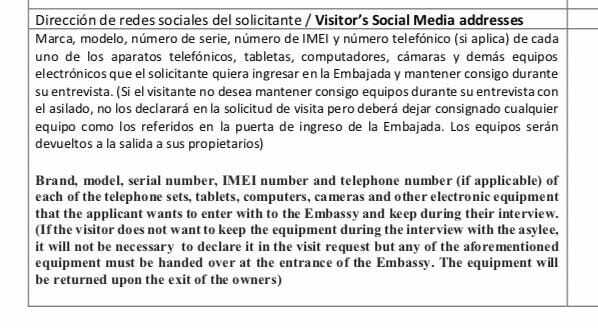 After receiving permission to visit (not something I was sure of by any means), I was given an authorization letter that I had to provide, along with my passport, at the door of the embassy before being allowed in. Once inside, my bag was searched and I was scanned with a metal detector, TSA style. Given the amount of enemies that Assange has made, this seemed appropriate. As this was taking place, Assange walked by — all smiles — which was immediately reassuring as I had been tremendously worried about his wellbeing given the tough restrictions placed on him by Ecuador’s new regime. The reassurance didn’t last long. After being guided into the conference room, the same place we initially met at the beginning of my last visit, I immediately noticed a marked increase in the amount of cameras in the hallways and around the large meeting table. After saying hello, we tried to go to another room with less surveillance so we could speak more openly. Within minutes, a member of the staff at the embassy came knocking on the door and demanded that we go back. As we walked through the hall, I noticed that there was no angle that wasn’t being recorded by a forest of menacingly Orwellian black cameras. Currently, Assange cannot even have a simple visit with a friend without it being monitored by some shadowy state actor. It’s like a scene from the Stasi spy drama The Lives of Others. As John Pilger pointed out after his visit with Assange on New Year’s Eve, it could be any newspaper publisher or editor stuck in that embassy. For the crime of publishing journalism, Assange has not only had to give up his freedom, but also any semblance of privacy. It’s impossible to overstate how unsettling it feels to have multiple lenses pointed at you wherever you stand. Unable to speak privately, even with a noise machine attempting to muffle the microphones from picking up conversations, we resorted to passing notes. Assange is not only barred from sharing his views online under the new regulations — thanks to the constant surveillance, he can’t even do so among his friends in the embassy where he is arbitrarily detained. If we value the principle of the freedom of speech — we must do something to stop this madness. While we do not know what Assange has been charged with by the U.S. as it remains under seal, we do know that it is related to his work as a publisher, the only publisher with a record of 100% accuracy. His dedication to truth is so profound that he has never once had to issue a correction or retraction. In the age of “fake news,” the work of WikiLeaks should be celebrated, not persecuted. The WikiLeaks founder entered the Ecuadorian Embassy in London on June 19, 2012. He was soon granted political asylum. The UK has long refused to acknowledge the findings of the UN Working Group on Arbitrary Detention (UNWGAD), which found that Assange is being arbitrarily and unlawfully detained and must be immediately released without the threat of arrest and compensated. On a positive note, Assange seemed to be in good spirits — especially considering his circumstances. He looked good, though thinner, and was as brilliant and sharp as ever. Despite the efforts from the US and Ecuador to make his life a living hell, they haven’t broken him yet. It is clearly a lot more difficult to break someone who knows how necessary and important their cause is. The freedom of speech and freedom to publish are rights that must be protected at all costs, and Assange’s dissent does just that. 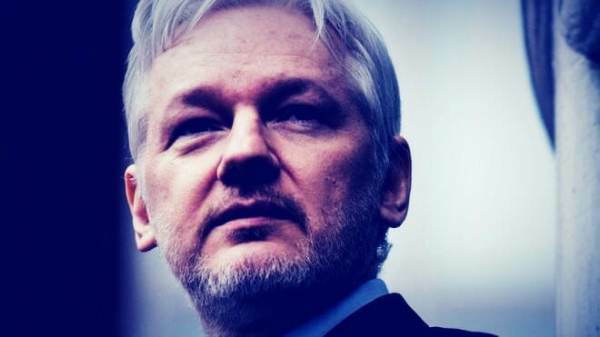 If President Donald Trump really wanted to show the world that he is committed to real news, he would end this witch hunt and allow Assange to get back to work.